One another STEEM blockchain-based bot. It's name is @remind-me. You can mention him in your comment in order to create a reminder. The truth is vast majority of posts gets obsolete after payout is being made. If a post (or a comment) includes a promise, a prediction or a bet, you can create a reminder in order to verify it in future. I hope it’s going to spark interesting discussion, once again, but at the time perspective. On the other hands, you can use it for an ordinary use-cases, including future event (dlive stream reminders etc). you will be responded with the reminder creation confirmation comment. when the time will pass, you will be notified (by mentioning you) in another comment. See the full comment context here. @someone, you have just told BTC is going to hit 20 000$ by the end of 2018. Next live stream is scheduled for tomorrow, same time? add reminder registration comment queue. add reminder resolution comment queue. 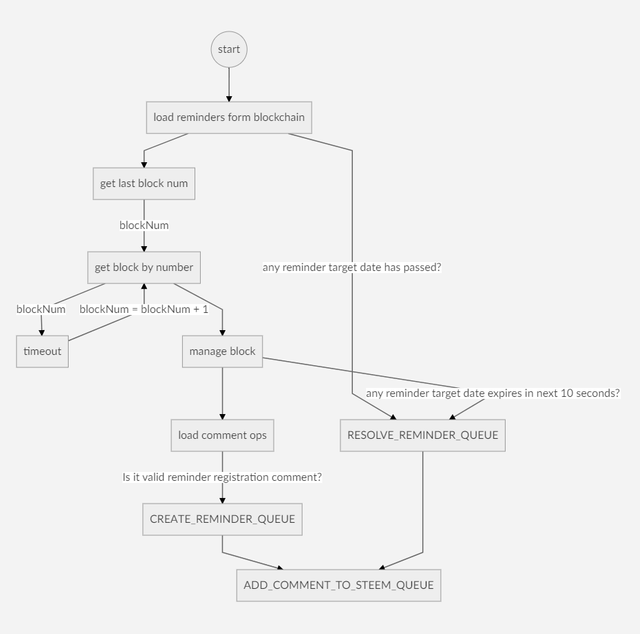 fetch block from STEEM blockchain queue. Why queues? It is ease to maintain, control a flow, retry when error occurs etc. Queues are managed by better-queue package. Reminder date is being retrived from user comment within chrono-node package. What's more I'm using helper packages, including moment, lodash, uuid, nconf. Calling @remind-me in posts won't create a reminder. You should be aware, that a bot creates a reminder in UTC. To prevent spamming, one account might create three reminders per day. I am planning to add "reuse reminder feature", which is basically a way of reusing existing reminders among a group of steemians. (Another person can upvote you reminder, so he will also be notified, when the time passes). I believe SMT / communities will bring some new capabilities, that might extend the app with new features. In terms of coding that will not be even a big issue for you. Just read each line of the comment and assign it in to an array of strings (each line of the comment as one element of the array) then loop through the array as per array.length (that will let the code know that if the array.length > 1 there are more lines to look at) and do a text matching into a couple IF statement containing some keyword as (Day, Hour, Minute, etc...) to know where to start looking for the time of the set reminder then pass the result to the other functions. In the very beginning the entire comment text was allowed to be parsed in order to search for a target date. What I was concern about was that a random text might be picked by a search algorithm instead of user-intended one. It's important, as even ordinary words matter, like "today", so a comment starting with "How are you today?" might fool an algorithm. That might be tricky, so eventually decided to use one-line rule, as it's more secure, but - as you pointed correctly - less user friendly. Really appreciate your input. Thank you for your comment! I agree that a comment such as "how are you today" could fool the algorythm but in the meantime whoever will tag remind-me is already aware of what he is doing so i dont think he might write such comment. The only possibility i forsee is that he could write his date/time on another line. Still the "how are you today" example could be excluded by the algorythm since a reminder will have any date/time keywords but the most important thing is they will use AT or ON as a prefix to their messages most of the time like "ON the 2th of June 2019" or " AT 5:00 a. m.". Thus filtering aswell using this keywords will help in detecting REAL reminders. Again great job and keep the good work up!! Thanks for the contribution. This will be useful for sure. :) I will try to take advantage of it. One small note, it seems there is a small typo on that function. Thank you for your moderation effort and a note! -2 minutes seem not to be a valid date, that is why it is ignored.